Many large servers and workstations require higher capacity modules in order to reach system memory capacities of several gigabytes or more. There are two ways to increase the capacity of a module. Manufacturers can stack chips on top of one another, or they can stack boards. With chip stacking, two chips are stacked together and occupy the space that one chip would normally take up. In some cases, the stacking is done internally at the chip manufacturing plant and can actually appear to be one chip. In other cases the chips are stacked externally. 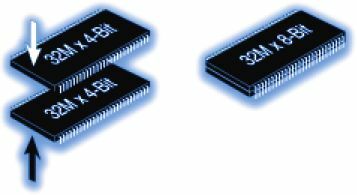 The example below shows two externally stacked chips. Example of externally stacked chips. As you might expect, board stacking involves putting two memory module printed circuit boards (PCBs) together. 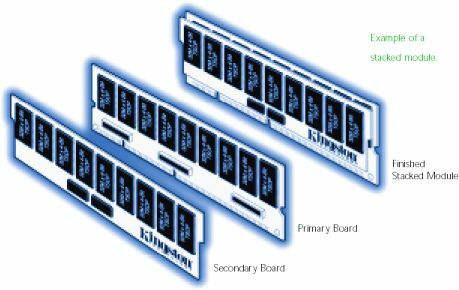 With board stacking, a secondary board mounts onto the primary board, which fits into the memory socket on the system motherboard. Example of a stacked module.